One of my favorite things are colored bottles. I love how the light shines through them and color is reflected on near by surfaces. This is an oil painting I did last year from a photo I took. It's 18x24 on canvas board. Very well done. I enjoy oil painting myself. The colors are inviting. Yes,having colored bottles to the light is so enjoyable. The bottles look so real! Great job! I love the colors! Very nice,thanks for sharing your art flare. Thank you so much for your very nice comments. This was one of my few attempts at Still-life painting, as normally I paint landscapes. WOW!! what a great shot and painting as well. very impressive, Kathy!! I admire your talent! 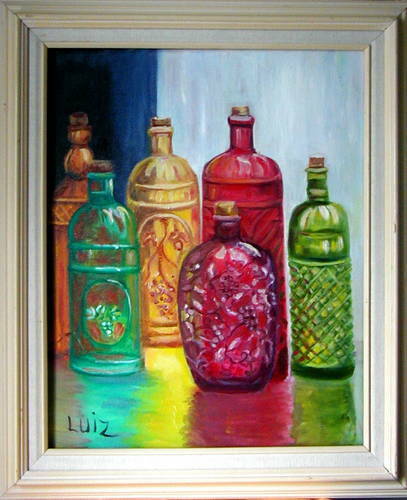 share your fondness for glass jars, bottles etc, and you have captured the "glint" on these in this painting. The detail on the cranberry coloured bottle in front is so good - well, so it is with the diamond pattern on the green bottle also. Also like the pale amber bottle very much. Beautiful oil painting. You captured the transparency of the bottles.